I’m a traditionalist when it comes to Thanksgiving. I live for the classic dishes: turkey, gravy, cranberry sauce, and stuffing/dressing. Without those 4 dishes, it’s simply not Thanksgiving. I tend to make the same dishes year in and year out, but every so often I like to switch it up. I generally opt for the standard bread-onion-celery-sage stuffing, pimped up with some roasted chestnuts and maybe sautéed leeks. But this year, since I decided to BBQ my turkey, I thought I’d find a more Southern-style, yet classic stuffing. 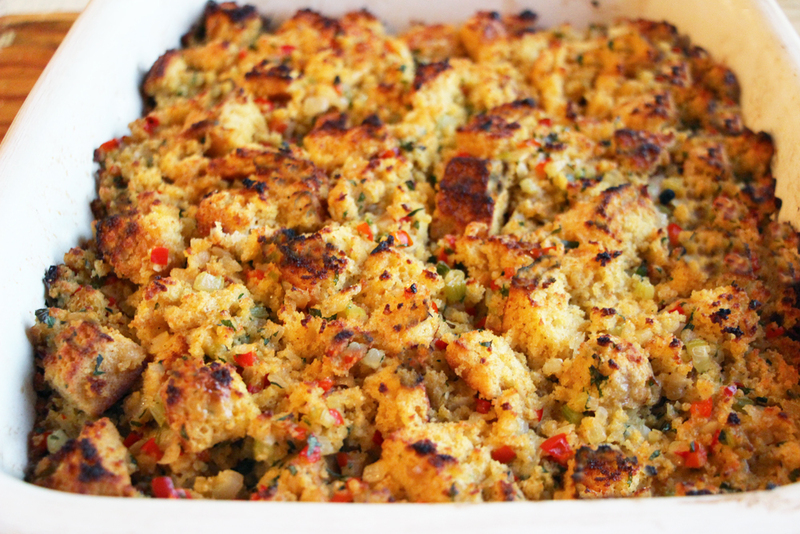 Sweet and salty, this cornbread stuffing is a colorful addition to your Thanksgiving table. Long ago I stopped stuffing my bird, and I don’t recommend it (mainly because you would have to greatly overcook the bird to get the stuffing to a safe temperature to avoid food poisoning). 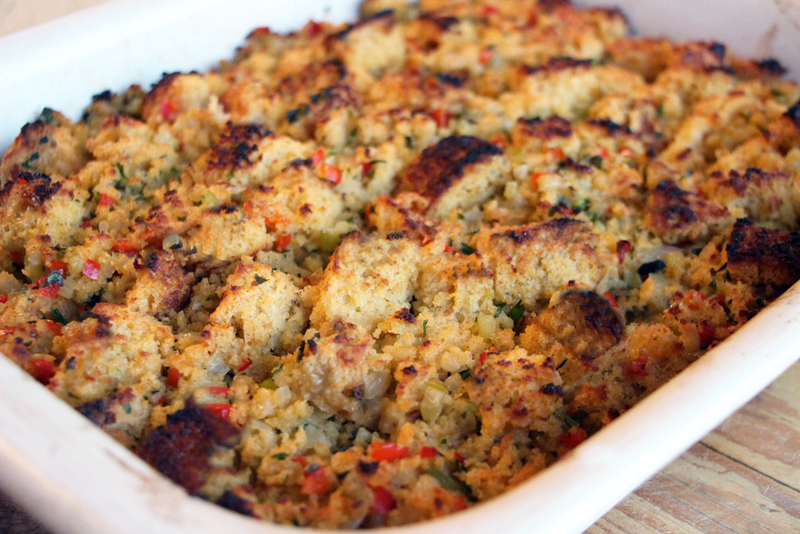 I prefer to bake my stuffing (in which case it’s really called “dressing” but I still call it stuffing) in a generously buttered baking dish so that the edges and top get browned and crisp, and the interior stays moist and succulent. The amount of sweetness truly depends on the cornbread you use for this, so if you prefer a more salty-savory stuffing, by all means make (or buy) a less sweet cornbread. 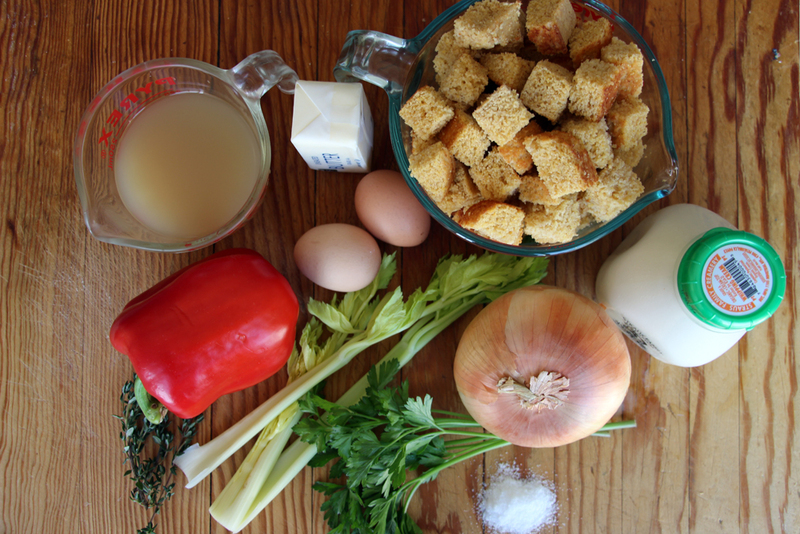 Cornbread and Red Pepper Stuffing ingredients. If making the cornbread, position a rack in the middle of the oven and preheat to 400°F. Generously grease a 9-by-13-inch baking dish (I use cooking spray). 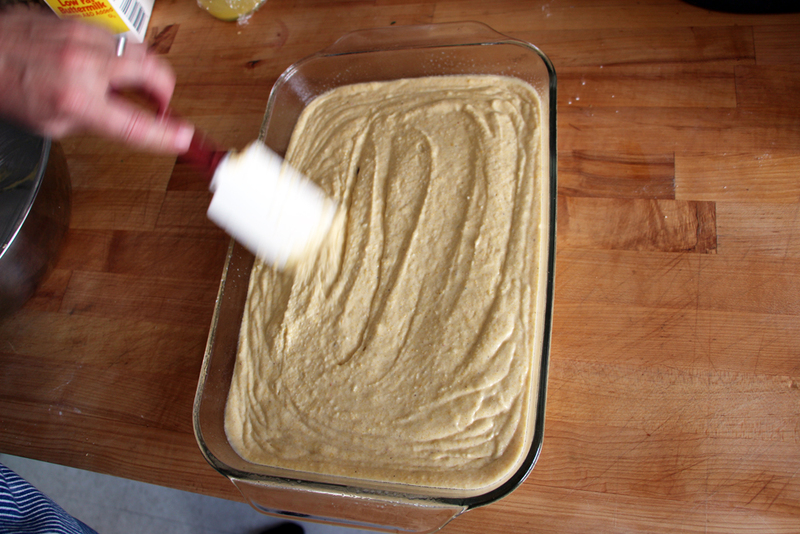 In a bowl, whisk together the cornmeal, flour, baking powder, baking soda, and salt. 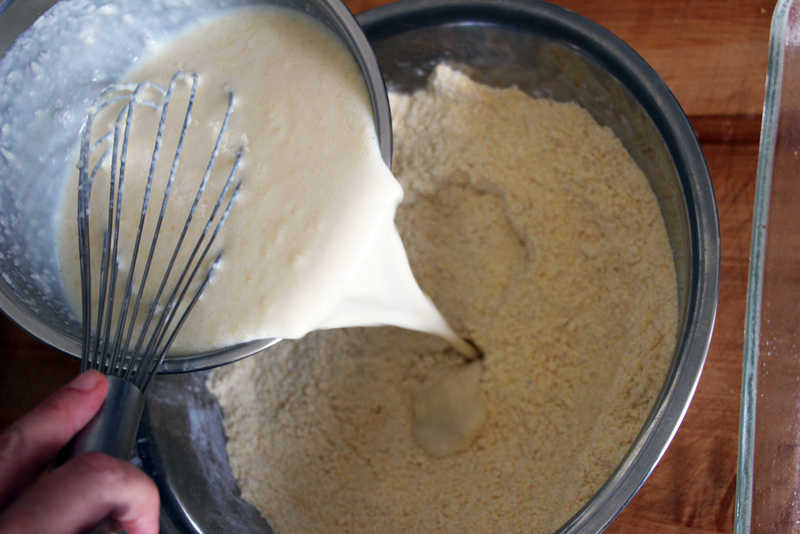 In another bowl, whisk together the eggs, brown sugar, buttermilk, and melted butter and whisk until blended. Add the dry ingredients and stir until evenly moistened. Scrape the batter into the prepared pan and smooth the top. Bake until a toothpick inserted into the center comes out clean, about 20 minutes. Let the bread cool in the pan on a wire rack. 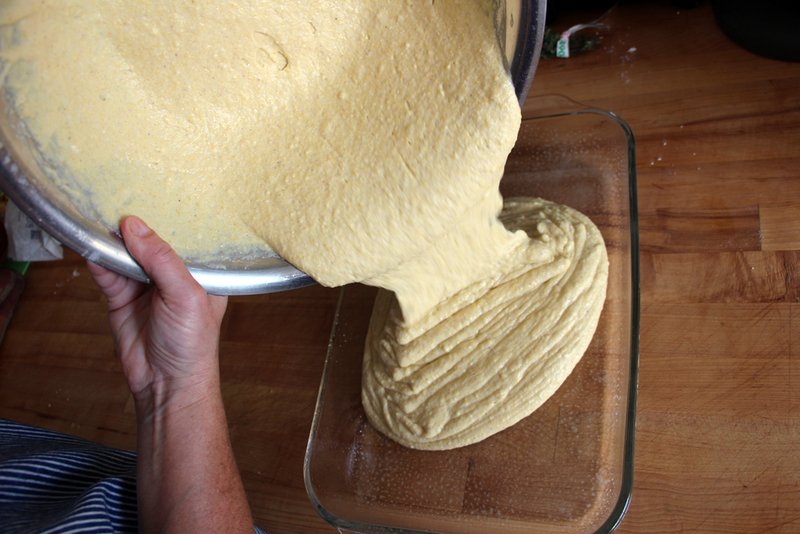 You can make the bread up to 3 days in advance. When cool, remove it from the pan and wrap tightly in plastic wrap. Store in a cool place at room temperature or in the refrigerator. 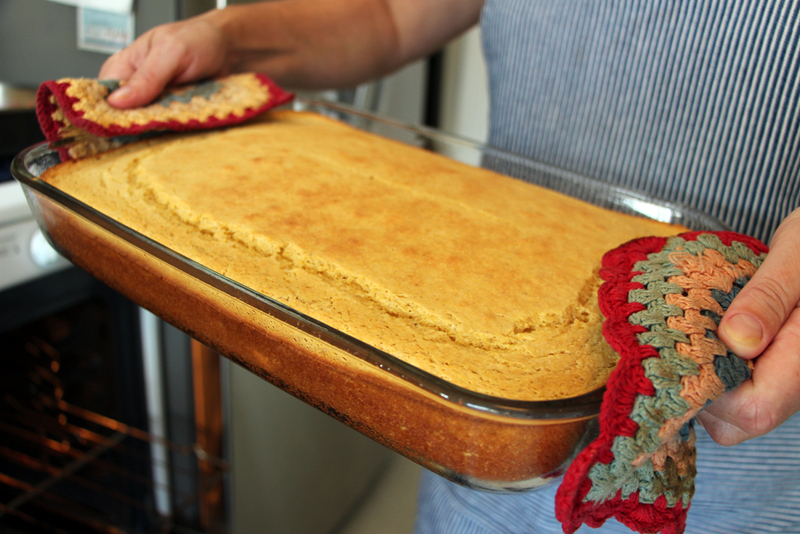 Remove the cornbread from the oven and let it cool in the pan on a wire rack. When ready to make the stuffing, remove the cornbread from the plastic wrap (if stored), and cut into bite-sized chunks. Spread on two large rimmed baking sheets and set aside. Preheat the oven to 375F. Generously butter or spray a 9-by-13-inch baking dish. 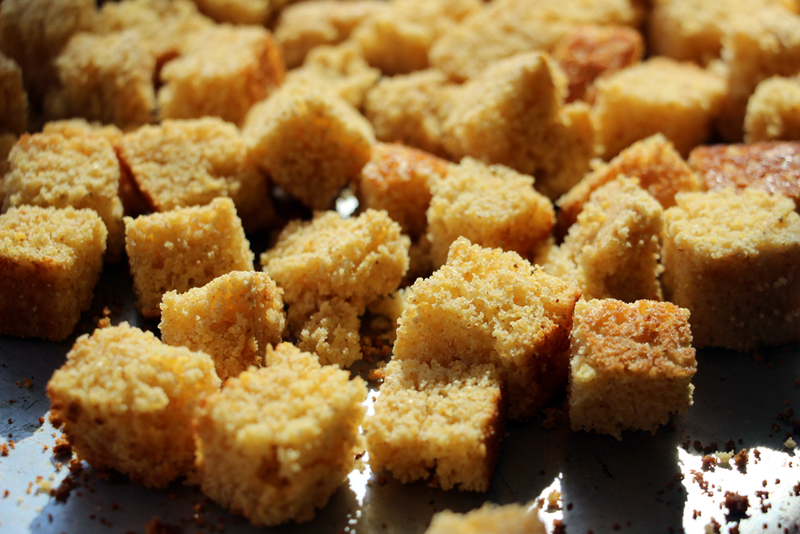 Toast the cornbread cubes in the oven until lightly browned, turning occasionally, about 15 minutes. Meanwhile, in a large sauté pan, melt the 1/2 cup butter over medium-high heat. Add the onion, celery, bell pepper, and thyme and sauté until the vegetables are tender and starting to brown, about 10 minutes. Scrape into a large bowl and stir in the parsley. 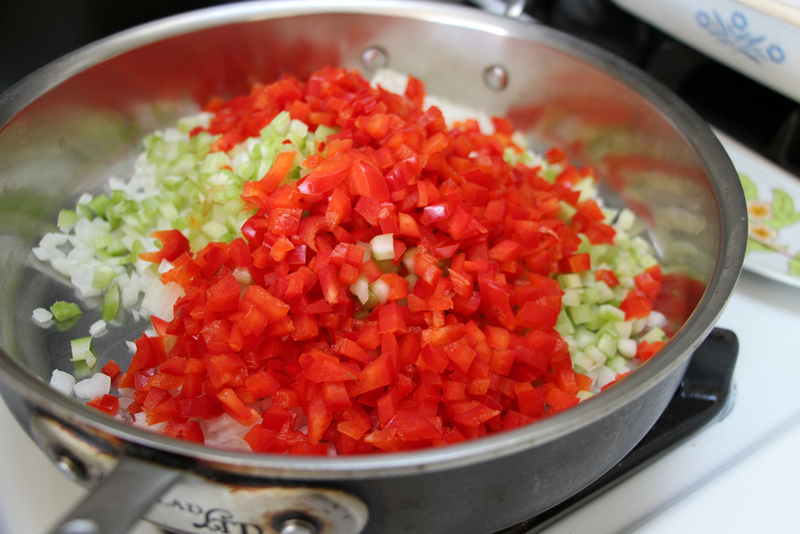 Add the onion, celery, bell pepper, and thyme and sauté until the vegetables are tender and starting to brown, about 10 minutes. 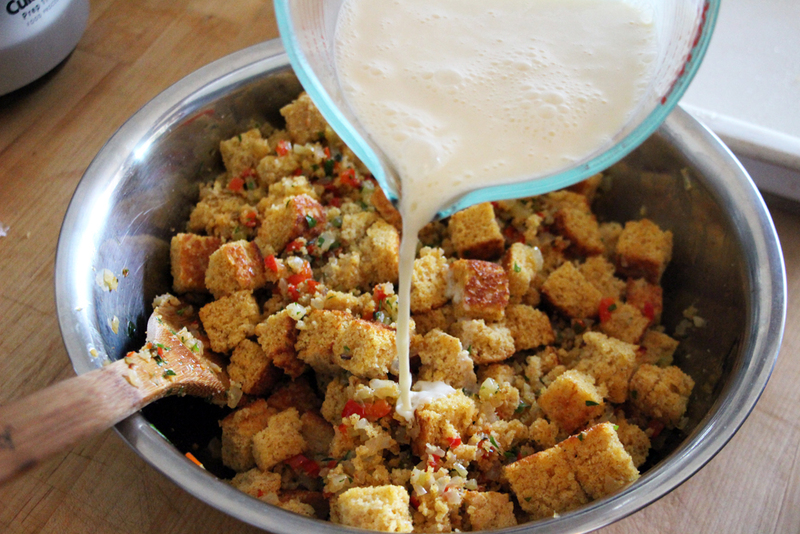 Add the toasted cornbread cubes and toss to combine. Taste for seasoning and add a sprinkle of salt as needed. In a bowl, whisk together the eggs, chicken stock, and cream. Douse the stuffing and stir to combine. 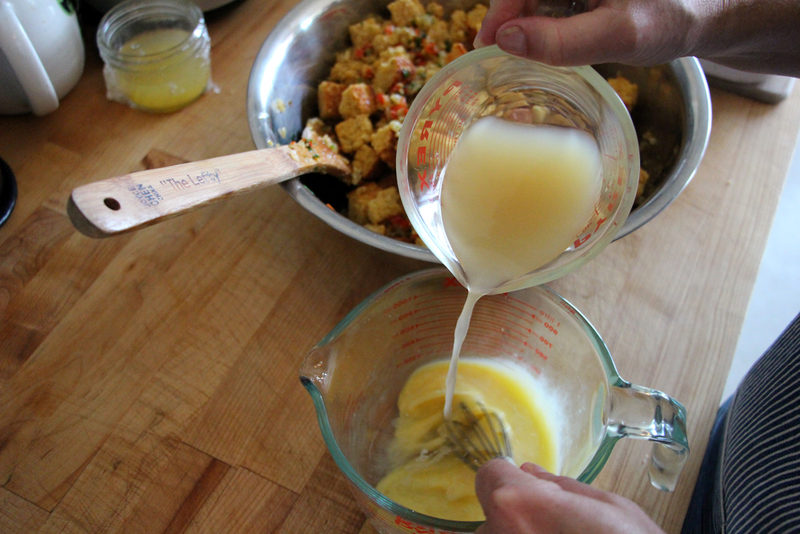 If the stuffing feels a bit dry, add up to 1/4 cup more chicken stock. Douse the stuffing and stir to combine. Whisk together the eggs, chicken stock, and cream. Scrape into the baking dish and spread into a thick, even layer. Cover with foil and bake for 30 minutes. Remove the foil and bake until browned and crisp on the top and edges, 20-30 minutes longer. Remove the foil and bake until browned and crisp on the top and edges, 20-30 minutes longer.